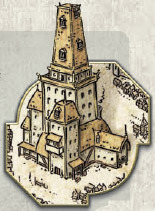 Action: Take 1 Wizard ( ) from the supply and place it in your Tavern. 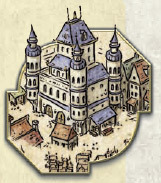 The headquarters for the Guild of Stonecutters, Masons, Potters, & Tile-makers is the first stop for anyone wishing to add to the great city of Waterdeep. Start of Round: Place 1 VP token from the rounds track on each Building tile available for purchase. Action: Choose 1 Building, pay its cost in Gold, and put it into play under your control. (Place one of your control markers on the Building tile to identify the owner). Score any VP for the newly purchased Building. Then draw a new Building tile and place it face up in the vacated space. 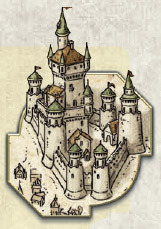 This mighty stronghold on top of Mount Waterdeep can be seen from nearly every corner of the city. Action: Take the First Player marker, and draw 1 Intrigue card. The proprietor of this rambling tavern knows a wealth of tales. 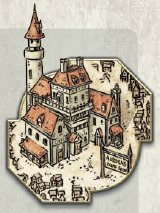 The inn's cellars are rumored to connect to the city sewers and Undermountain. Action: Take 1 face-up Quest card from Cliffwatch Inn. As well, take 2 Gold ( ) from the supply and place it in your Tavern. Action: Take 1 face-up Quest card from Cliffwatch Inn, and draw 1 Intrigue card. Action: Discard all the face-up Quest cards from Cliffwatch Inn. Draw new Quests from the Quest deck, and place them face up in the open spaces. Then take 1 face-up Quest card from Cliffwatch Inn. 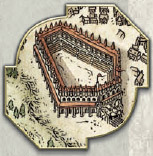 Exciting spectacles of martial skill are staged in this enormous open-air stadium. Action: Take 2 Fighters ( ) from the supply and place them in your Tavern. This tavern is adorned with battle trophies from all ends of Faerûn, but every one is a fake. Action: Take 2 Rogues ( ) from the supply and place them in your Tavern. This needle-like tower is home to those faiths without the congregation to support an independent temple. 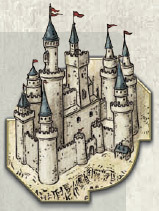 Action: Take 1 Cleric ( ) from the supply and place it in your Tavern. 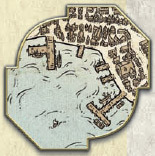 Waterdeep gets both its name and its wealth from this deep-water basin. Action: Play 1 Intrigue card from your hand. 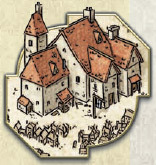 Reassign Agent: After all Agents have been assigned in the round, each player with an Agent in Waterdeep Harbor reassigns that Agent to another action space. Start with the Agent in the action space numbered "1", and proceed in numerical order.